A common thing when having a conversation is to have a set of variables keeping track of who you are talking about. The simplest is "you". So, in my scheme how can we learn something about you? We really wanted Fred to be 29, not "you". -- see the current definition of "you"
-- so it is "Fred"
ie, inching ever closer to natural language. And I think we can get even closer still! So, it is a common thing to apply the same operator over and over again. -- we are past the bottom of the tree! Note that child^k only gives you horizontal slices through the tree. What if you want a vertical component too? Finally, what if you want everything, but you don't know how deep to go? Finally, the idea of "six degrees of separation"
That's more than enough for now. More later! Now we need some method to make use of it. And hence the semantic agent console. From here on, anything that starts with "sa: " can be assumed to be in the console. q, quit, exit                quit the agent. Warning! you will lose all unsaved work! -- comment                   ignore, this is just a comment line. This is just an example of the kind of knowledge a bot might need to try the Loebner contest. First, we build up a data set of personality details. Now, as I said previously, ket labels can be anything except <, |, > and \r and \n. But we have some conventions. For a start we separate categories from sub-categories using ": ". also with the convention that the sub-categories are a subset of the parent category. (though perhaps in some cases it is useful to break this convention). So in this case, tree is clearly a subset of the concept plant. And elm is clearly a subset of the concept tree, and plant. Note that we are not forced to use categories (which I guess could equally validly be called "data-types"). So, while categories/data-types are not mandated, they are often useful. We use this (again by convention) to define a list of objects. |category: *> matches all members of "category". Update: we have conventions for operator names too! op |x> => |a> + |b> + |c> is type 1.
op |x> => 3.14159|x> is type 2. Type 2 operators are very useful when working with lists of objects. Examples of this later! The other thing to note is that in general type 1 operators do not commute, but type 2 operators always commute. 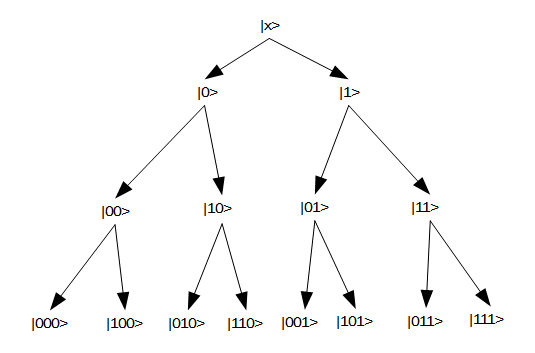 op2-self op1-self |x> == op1-self op2-self |x> for example. So, the standard learn rule is already quite powerful (though we add more power later). Certainly powerful enough to map a flow chart to a relatively readable BKO. So, if we study the flow-chart vs the BKO we observe that nodes in the chart map to kets, and arrows map to operators. eg, |document: www proposal> and "describes" respectively. Indeed, if text was not 1D, we could actually put the operators above the => symbol, to make the mapping even clearer. I guess the final thing to note is that all the coeffs are 1, since in this flow-chart the arrows do not specify weights. So, the notation I use is motivated by the bra-ket notation as used in quantum mechanics, and invented by the famous physicist Paul Dirac. Note though that the mathematics of my scheme and that of QM are vastly different. Essentially any text (currently ASCII only) can be inside bra/kets except <, |, > and \r and \n. Though we do have some conventions, more on that later. Next, we have operators, that are again text. Next, we have what I call "superpositions" (again borrowed from QM). A superposition is just the sum of one or more kets. But a full superposition can also have coeffs (I almost always write coefficients as coeffs). This BTW, is what we call a "learn rule" (though there are a couple of other variants). 1) <x||y> == 0 if x != y. 2) <x||y> == 1 if x == y. 18) |> is the identity element for superpositions. sp + |> == |> + sp == sp. 19) the + sign in superpositions is literal. ie, kets add. And that is it for now. Heaps more to come! Update: I guess you could call superpositions labelled, sparse vectors. By giving each element in a vector a name, it gives us the freedom to drop elements with coeff = 0. For large sparse vectors, this is a big win. For large dense vectors, there is of course a price to pay for all those labels. And since we have labels we can change the order of the elements without changing the meaning of the superposition. Say if we want to sort by coeff size. This is harder if you use standard unlabeled vectors. I guess the other thing to note about superpositions is that they allow you to define operators with respect to vector labels, and not vector positions. So, I've been tinkering/coding some ideas for knowledge representation and semantic web for about a year now. Roughly 14,000 lines of python for the whole project. Anyway, I think now is the time to try and get others interested in my project. I like to think I have some interesting ideas, let's see if others do. In terms of describing what I'm trying to do, I currently only have this though it is rather minimalist when it comes to words. Its really just a series of examples of my notation, rather than a decent write-up. Maybe this blog will help explain my ideas.